This House would establish a program to revive extinct species and re-introduce them into the environment. Earning spots in the final round after three rounds of debate were two Greater Hartford Academy of the Arts teams. Aiden Gillies, Anni Ciarcia and Gavin Anderson took first place. Samantha Acosta and Weimy Montero finished second. Ruth Mercedes, Meredith Macey and Phoebe Kurth from St. Luke’s School placed third. Amelie Warneryd from St. Luke’s School earned the top speaker award. Deidre Chill from Westfield Academy placed second and Wendy Zhang from Amity Middle School was third. 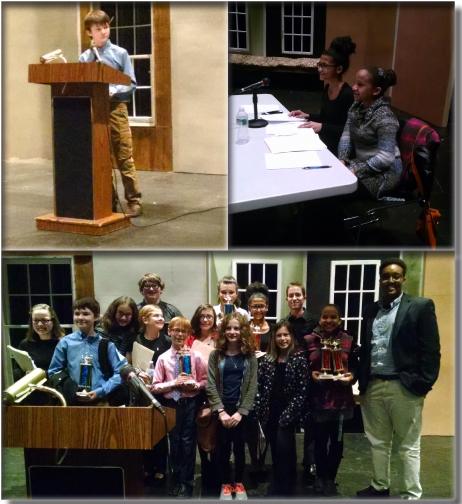 Thank you to TJ Noel-Sullivan and the Classical Magnet School in Hartford for hosting the CT Middle School Debate League’s largest tournament to date and to the Greenwich Branch of the English Speaking Union for sponsoring the League. The next tournament will be held on Saturday, January 23, 2016, at Eastern Middle School in Greenwich. The snow date is January 30th. Click here for more information.